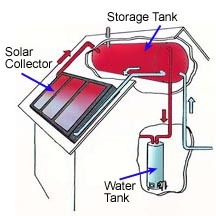 Thermosiphon water heaters use solar panels or collectors to trap the sun's heat. As water passes over the collector surface, it absorbs heat and increases in temperature. The warmed water then rises naturally into a storage tank. Because there are no pumps or motors, thermosiphon systems are known as "passive" rather than "active." Active systems use electric pumps to move the water from the collectors to the storage tank. Thermosiphon water heaters require no outside source of power because they use the natural tendency of water to rise as its temperature increases to push water from the collectors to the storage tank, which must be located 1-1/2 feet or more higher than the collectors. Thermosiphon systems may be able to supply up to 70% of a family's annual hot water needs. In the right climate and with the right usage, the monthly savings on hot water costs can add up to a handsome return on investment.